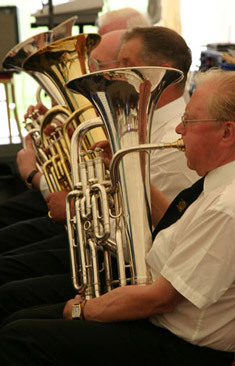 Welcome to the Beverley Brass Band website. The band has been entertaining the public of Beverley and the East Riding of Yorkshire for many years. Read about the history of the band and about our aims for the future. If you would like to listen to the band or find out if we are performing near you please view our list of engagements. If you would like the band to perform at your please visit our book us page. The band always welcomes new players (please check our current vacancies). To see us playing please visit our engagements page or our photo blog. If you or your child are interested in playing in the band or you just want to find out more about us please contact us. Beverley Brass Band is once again looking forward entertaining the people of Beverley, Hull and East Riding of Yorkshire over the coming year. We are a friendly band who thoroughly enjoy being an active part of this community and encourage other musicians of all ages to consider joining us.